Felipe Alou played 17 seasons (1958-74) for 6 teams, mostly the Giants and Braves. 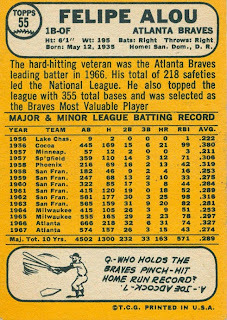 Although mostly an outfielder, he played about half his games at 1st base from 1965-67 with the Braves and from 1971-73 with the Yankees. Felipe is the oldest of the 3 Alou brothers, who all began their careers with the Giants. Felipe's son Moises also played in the majors from 1990-2008. 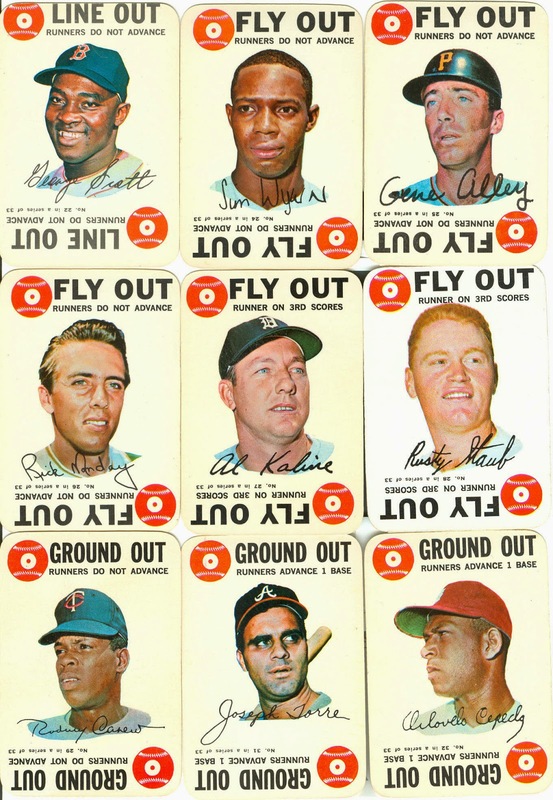 Alou was signed by the Giants in 1955, and played 2 ½ seasons in the minors before making his big-league debut with the Giants in June 1958. Felipe backed up rookie Willie Kirkland in right field for the remainder of the season. 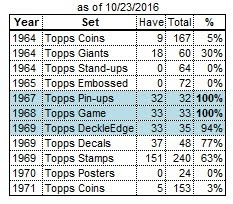 1959 was more of the same for Alou, backing up Kirkland in right field. In late July, rookie Willie McCovey joined the Giants, which caused incumbent 1st baseman Orlando Cepeda to play about half his games in left field for the next few seasons. 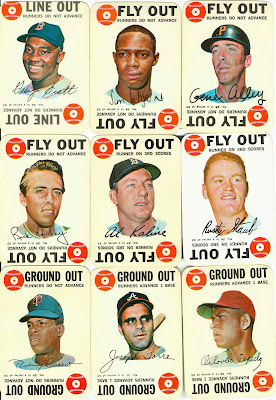 With Willie Mays in center field, all other outfielders would have to vie for playing time in right field. 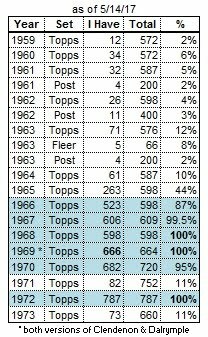 In 1960 Alou was the regular left fielder for the 50+ games when Cepeda would move in to 1st base. From 1961 to 1963, Felipe was the Giants' regular right fielder, often backed up by his brother Matty. His youngest brother Jesus joined the Giants in September 1963, Felipe's last few weeks with the Giants. All 3 Alou brothers played in the same outfield only once – on September 15th. After the season, Felipe was traded to the Braves (with pitcher Billy Hoeft, catcher Ed Bailey, and infielder Ernie Bowman) for pitchers Bob Shaw and Bob Hendley, and catcher Del Crandall. Alou began the '64 season as the Braves’ starting center fielder, but by mid-June had lost that post to Lee Maye, and spent the remainder of the season as the 4th outfielder. Felipe began playing 1st base in 1965, and spent the next 3 seasons dividing his time between 1st, left field, and center field. He also was quite good with the stick. 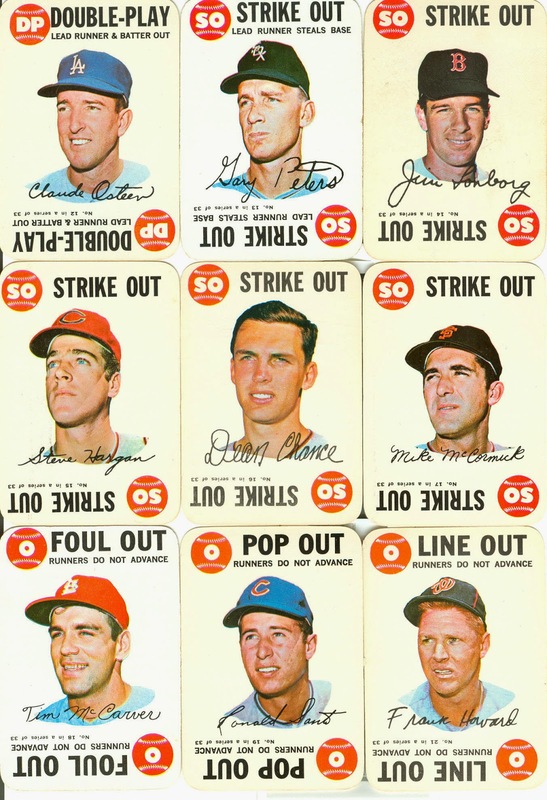 In 1966 he finished 2nd among NL batters with a .327 average (right behind his brother Matty). 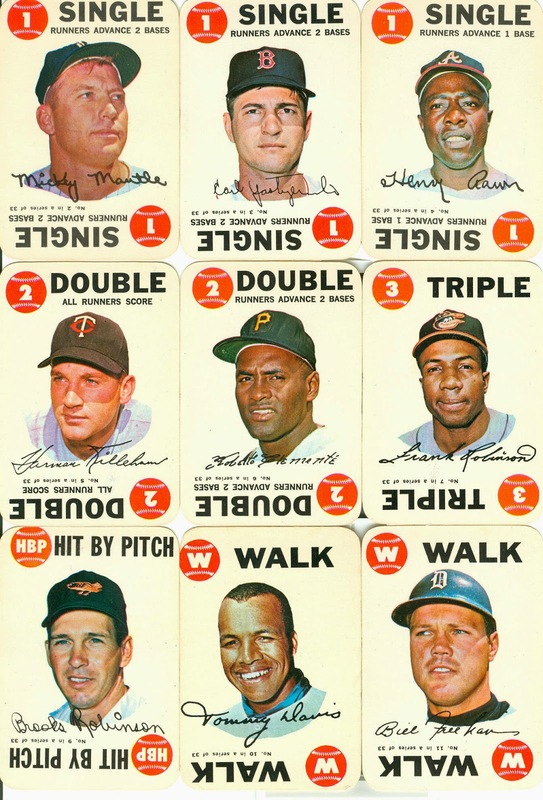 In 1968 he finished 3rd (behind Pete Rose and Matty) with a .317 average. 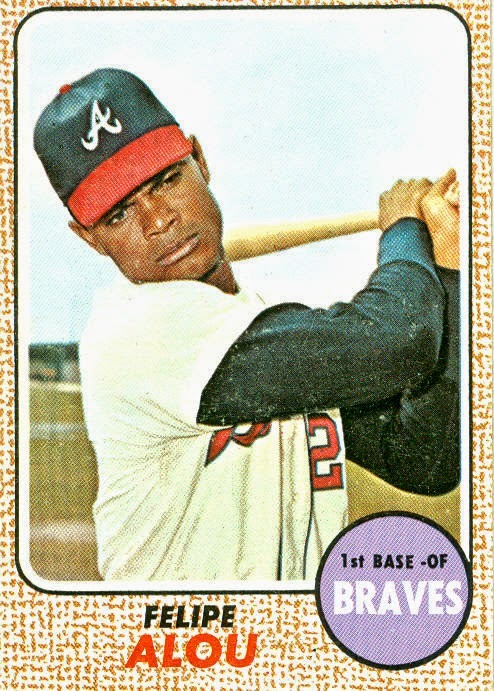 After Mack Jones was traded away following the 1967 season, Alou spent the next 2 seasons as the Braves' regular center fielder. 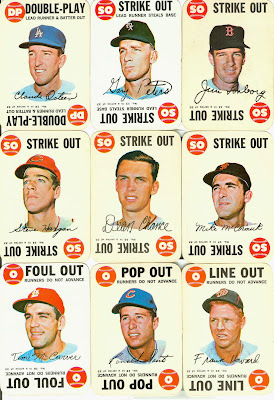 After the '69 season, he was traded to Oakland for pitcher Jim Nash. Alou only spent one full season with the Athletics. At age 35, he played in an outfield that included Rick Monday and Reggie Jackson, both 24. Felipe played in left field, and also 70 games in right (mostly when Jackson played center in Monday's absence). Felipe started the first 2 games of the 1971 season, then at week's end was traded to the Yankees. He played the rest of '71, all of '72, and most of '73 in the Big Apple. 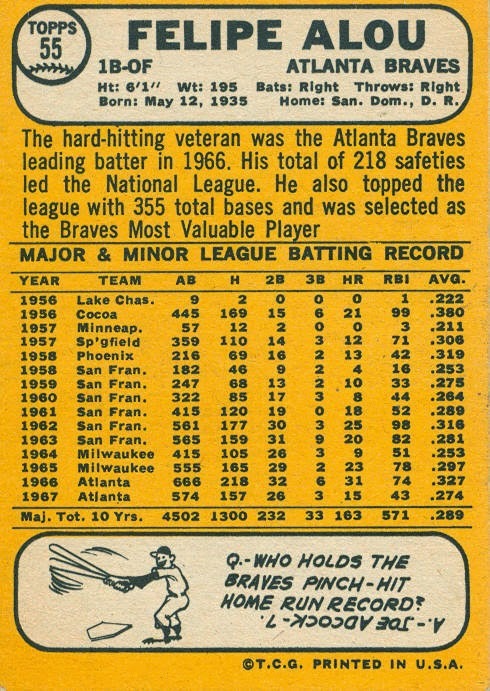 He was a regular in 1971, playing RF/CF/1B. For the next 2 seasons he shared the first base job with Ron Blomberg. In September 1973 Alou hit the road again, this time for Montreal. He played 19 games for the Expos during the season's final month, then was sold to the Brewers in the off-season. After 3 games with Milwaukee, he was released in April 1974. Alou became a manager after his playing career, with stops in Montreal (1992-2001) and San Francisco (2003-06). Recently, there has been a lot of discussion about these playing cards over at The Five Tool Collector blog. 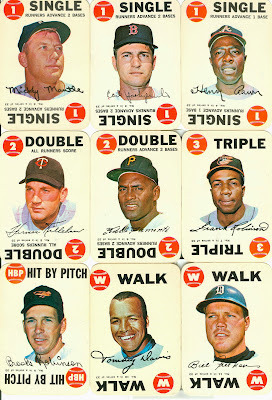 If anyone is interested in these cards, I would be open to trades that would help me complete my 1966 and 1970 Topps sets, or anything else that is found on my want list. Please contact me by email (found on my profile page).